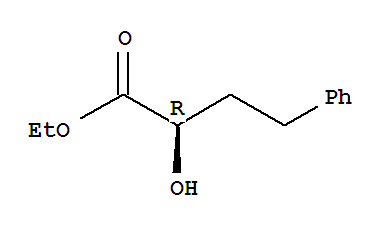 The IUPAC name of Ethyl (R)-2-hydroxy-4-phenylbutyrate is ethyl (2R)-2-hydroxy-4-phenylbutanoate. With the CAS registry number 90315-82-5, it is also named as R-2-Hydroxy-4-phenyl butyric acid ethyl ester. The product's categories are Alcohols, Hydroxy Esters and Derivatives; Chiral Compounds; Chiral; Intermediate of Benazepril Hydrochloride; API; Chiral Building Blocks; Esters (Chiral); Synthetic Organic Chemistry; Chiral Building Blocks; Esters; Organic Building Blocks. Besides, it is colorless to light yellow liquid, which should be stored in closed, dry place at 2-8 °C. This chemical is used as an intermediate of lisinopril and ACE-inhibitors. In addition, its molecular formula is C12H16O3 and its molecular weight is 208.25. When you are using this chemical, please do not breathe vapour. And you should avoid contact with skin and eyes. The other characteristics of Ethyl (R)-2-hydroxy-4-phenylbutyrate can be summarized as: (1)ACD/LogP: 2.02; (2)# of Rule of 5 Violations: 0; (3)ACD/LogD (pH 5.5): 2.02; (4)ACD/LogD (pH 7.4): 2.02; (5)ACD/BCF (pH 5.5): 20.08; (6)ACD/BCF (pH 7.4): 20.08; (7)ACD/KOC (pH 5.5): 297.94; (8)ACD/KOC (pH 7.4): 297.94; (9)#H bond acceptors: 3; (10)#H bond donors: 1; (11)#Freely Rotating Bonds: 7; (12)Polar Surface Area: 35.53 Å2; (13)Index of Refraction: 1.519; (14)Molar Refractivity: 57.6 cm3; (15)Molar Volume: 189.6 cm3; (16)Polarizability: 22.83×10-24cm3; (17)Surface Tension: 41.6 dyne/cm; (18)Density: 1.098 g/cm3; (19)Flash Point: 137.6 °C; (20)Enthalpy of Vaporization: 60.54 kJ/mol; (21)Boiling Point: 330.9 °C at 760 mmHg; (22)Vapour Pressure: 6.44E-05 mmHg at 25 °C.